Superior Insulative coating for hot summer & water proof for monsoon. It makes a comfortable working atmosphere for family members at home and workers in factory shed. Saving in electricity bill for air conditioning. 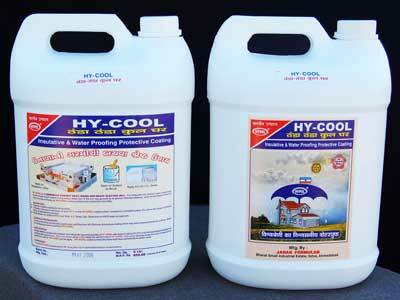 HY-COOL Coating is washable, Eco-friendly and fungus resistive. Most ideally can apply on RCC roof, Wall, A.C., Sheet & Water storage tank. Packing:- 5 ltr., 35 ltr., 50 ltr., 200 ltr. We are tagged as one of the most illustrious Reflective Heat Insulation Coatings Manufacturers and Suppliers from India. Very high radiant heat reflectivity and very low thermal conductivity to provide wonderful thermal insulation effect. Very good sound isolation effect for reduce the sound of raindrop out side. Excellent water resistanting property to permit no other waterproofing construction. Water based and environment friendly contain no heavy metal and other hazzardes substances. Good adherence to cement, wood, metal, frp etc. substances.